On Saturday morning after a hearty local breakfast, we headed to Lantau Island to visit the Po Lin Monastery and try the famed vegetarian food served there. Lantau is the largest of Hong Kong’s many islands and is among the least populated. More than half of it is covered in park land, making it a pleasant contrast to the densely populated areas of Hong Kong Island and Kowloon. When I lived in Hong Kong in 1998-99, a visit to Lantau required a 45-minute ferry ride from Central and, if you wanted to go to the monastery, an additional bus ride to the far end of the island. Since 2006, you have had the option of taking the Nong Ping 360, a nearly 6 km gondola that leads from the Tung Chung MTR station across the water and over the peaks, dropping passengers off just a short walk from the monastery. The gondola ride, which takes about 25 minutes, is not for the faint of heart! 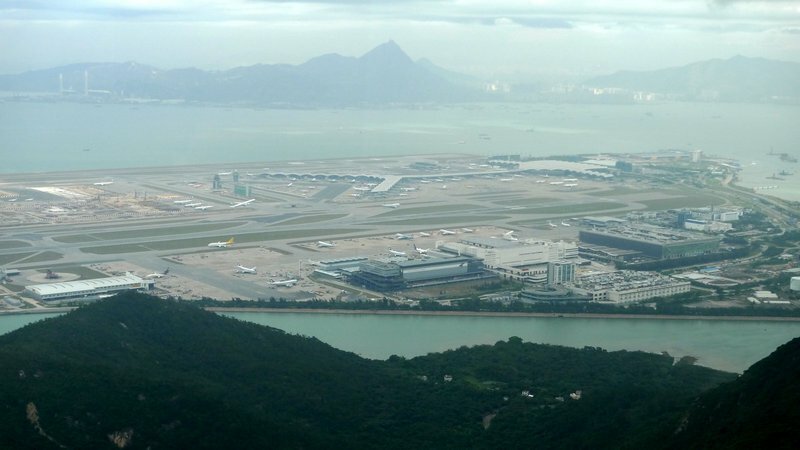 Along the way, you are treated to a spectacular view of Hong Kong International Airport. Built on neighboring Chek Lap Kok Island with tremendous amounts of landfill, HKIA serves more than 53 million passengers a year and will soon be building a third runway and additional gates. The Nong Ping 360 gondola sets you down in a shopping and entertainment area called the Nong Ping Village. Built in a Chinese architectural style, it contains a number of very touristy attractions and, of course, a Starbucks. We would have hurried past the village and on to the monastery but a stealth storm caught us. 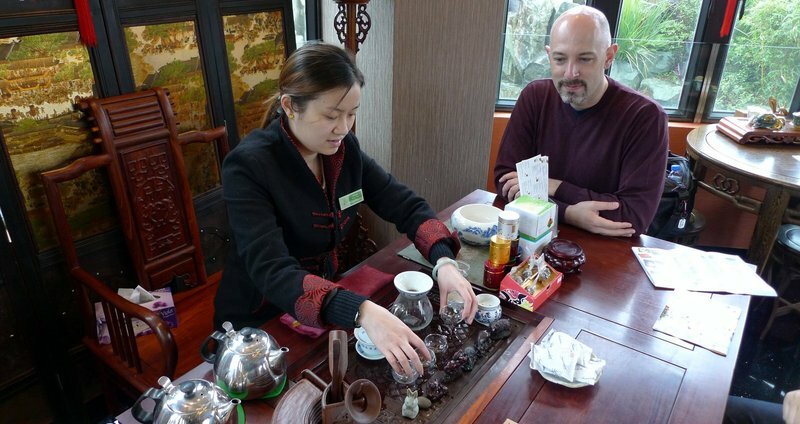 We sought refuge in a tea shop for an hour, where we learned the intricacies of the Chinese tea ceremony. After the rain, we headed to the Tian Tan Buddha, a 34 meter (112 foot) tall bronze seated Buddha statue that was, until 2007, the largest seated Buddha statue in the world. You have to climb 240 steps to reach the statue and on this overcast and misting day, the view was limited. Afterwards, we visited the Po Lin Monastery across from the entrance to the statue. The monastery, which dates from the early 1900s, is famous for its vegetarian food. When I visited in 1998, the food was very tasty. With the opening of the Nong Pin 360, the number of visitors has increased tremendously and, it seems, the quality of the food has declined. The spartan dining room was filled with visitors, mostly Chinese. We purchased a ticket in advance for a set meal and the dishes were brought by a waiter. The meal began with an odd soup. We struggled to identify the ingredient but eventually decided it was some sort of a yam or sweet potato. The texture was very soft and the broth itself was nondescript. A dish of stir-fried lettuce and shitake mushrooms. I expected that the mushrooms would have more flavor but these were pretty bland. Of course, I should point out the Buddhist vegetarian food is generally supposed to be bland – no onion or garlic, for example – as the purpose of food is to sustain life, not to bring pleasure. Stir fried vegetables and firm tofu. While this was a simple dish, the vegetables had a pleasing crunch that added some much-needed texture to the meal. A stew of corn, peas, and tofu in a tomato sauce. This was pretty tasty because the corn provided a more pronounced flavor than most of the other dishes. This stir fry dish had a trio of mushrooms, baby corn, carrots, and textured vegetable protein. TVP is basically made from soy flour, the after product of soybean oil extraction, and can be fashioned into meat-like pieces. This dish was actually pretty tasty and did provide more of a meaty feel. An interesting deep fried dish like a spring roll. The outer skin was very flaky, perhaps made from tofu skin? The inside was very bland but of course the crunchiness offered a nice change of pace. Interior view of the fried spring rolls. I think the filling was primarily daikon radish strips and carrots, although I may be wrong about that. Overall, the meal was a disappointment. The experience of getting to and from the monastery by gondola was interesting, though. While on the way there, we noticed a hiking path that more or less follows the gondola’s path from Tung Chung to Po Lin. It looks like it would take about 2-3 hours to hike. Maybe on a future trip the focus should be on hiking the route instead of eating the vegetarian food. As we left the monastery, the rain started to fall again. Along the path back to the gondola, Rudy spotted a shop (a tent, really) selling douhua, a dessert made with very soft tofu. You might best call it “tofu pudding” and it is served with a mild sugar syrup and has a pleasing texture. Served warm, this was the highlight of the trip, a perfect conclusion to an otherwise bland meal. This entry was posted in Uncategorized and tagged Dining, Eating, food, Gondola, hong kong, island, Lantau, Monastery, NongPin360, PoLin, PoLinMonastery, TungChung, Vegetarian by christao408. Bookmark the permalink. I would never get there because I would never be able to convince my brain it is ok to get on the gondola.I think the stir fry vegies and firm tofu looks yummy, along with the stew of corn, peas and tofu in a tomato sauce.My mouth is watering and these are wonderful photos. Oh – the view of the airport is nice although I know I would not be 100% comfortable in that gondola. I can’t believe they are adding another runway there. The tofu fa is always a nice little treat. Who knew tofu pudding would taste good? I wouldn’t have tried it based on the name and appearance and would have missed out. I actually would like to try the trio of mushrooms dish. It does look tasty. The gondola ride would certainly get my HR up. Looking at the pictures it almost looks like nice food. I like my meat but the photos are pretty… As for the gondola ride – NO WAY! You are very brave as the photo makes me think there is a lot of swing and bounce to that trip. You’ve hooked me with that soup. Now I’m wondering what it is too. Soup to start a meal is a grand tradition (especially for us Cantonese—prolly every kid has the command “yum tong ah” burned in their brain), and there are clear, sweet soups made from yams and melons and stuff. But those are usually dessert soups. It seems they have better vegetarian dishes now than before I used to have. I still remember I had the hot n’ sour soup, and then four other dishes. Your corn and the trio of mushrooms look so good! Warm and sweet douhua looks delicious! yikes, not sure i could survive that gondola ride. mm… douhua is so good! i still remember trying to make it from scratch… i’ve decided it’s way too much work to make soy milk myself, so i haven’t done it since then! Are onions and garlic not used because they are roots, and eating the root kills the plant? Well, it all LOOKS good. I could see how the flavor palate would be somewhat bland, though. chinese desserts in general are ‘meh’ to me but omg, douhau … I melt. Happy New Year! Those food looks extremely delicious. I always love Chinese – anyway, my own father is half Chinese & Jap. I have both the best side of his parents. Whenever we visited them in Japan, my Chinese grandma would serve us both the Chinese & Jap`s food. Extremely different from each other. Believe me or not – most of the Jap food are not meant for eating – it is more likely art and even when they do fish, it is called as art; not food! LOLThank u for sharing this part of your life and of Hong Kong! The pictures look so good though. Sorry the food didn’t taste as good as you had had previously. I don’t think I would be taking to gondola ride. @ZSA_MD – @Inciteful – @Grannys_Place – Okay, have added the three of you to my “don’t invite on a gondola ride” list. @SherryAngeLMysteriez – Glad you enjoyed it. Thanks for stopping by and commenting. @AppsScraps – Yes, I am also ambivalent about a lot of the desserts. @stepaside_loser – Corn starch – exactly. @BroDoc – White yams – there you go. Thanks! @DrTiff – But, I suppose, the blandness is the point. @Senlin – No, as BroDoc mentioned (and I believe he is correct), Buddhism is about recognizing that all suffering is born of desire. Highly spiced or flavorful food stimulates desire and, thus, suffering. I also know that the Chinese categorize food as “hot” or “cold” based on their effect on your overall energy and garlic and onions overstimulate your “heat”. @kunhuo42 – You, Mr. Zero G airplane ride, would have a problem with the gondola? Interesting… As for the dessert, there are just some things that are easier to buy than to make. Fun to try, though, isn’t it? @CurryPuffy – @beowulf222 – Pictures looked better than reality! LOL@Fatcat723 – I could go vegetarian but completely vegan, especially Buddhist, might be a bit much for me. @n_e_i_l – Except for the fact that the soup wasn’t sweet, it did have a dessert like quality to it. @murisopsis – Surprisingly, the ride was very smooth even when we could hear the strong winds whistling past the cabin. @awoolham – I would have thought you had tried the tofu dessert before! @ElusiveWords – The whole first half of the ride, which has a spectacular view of the airport, I mentioned to the other Xangans that you should have been there. @christao408 – yes, i have a fear of heights! and i agree, most things are fun to try once!